Found one file extension association related to CyberBuddy and 1 file format developed specifically for use with CyberBuddy. Keep reminders and get your attention when a reminder is due. Instant Message (like ICQ) with speech and animation. Bring you the latest Headlines, in several news categories. Give you the local Weather. Tell you the time at designated intervals. Get Stock Quotes - Reports when changes under/over limits. Check your favorite web pages for changes. Keep track and report on your internet speed. Read text, web pages, documents or the clipboard to you. Give Jokes & Thoughts of the Day from other CyberBuddies. Remember to give you a compliment. Let you have a little fun. Speech Recognition and Caller ID now available. 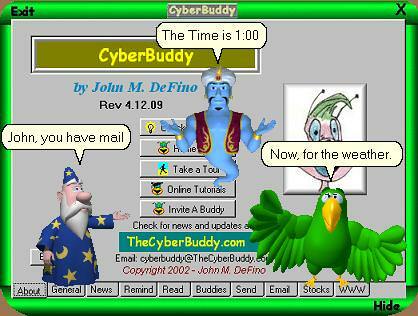 If you need more information please contact the developers of CyberBuddy, or check out their product website.